Our building is a knockout and available for hire. 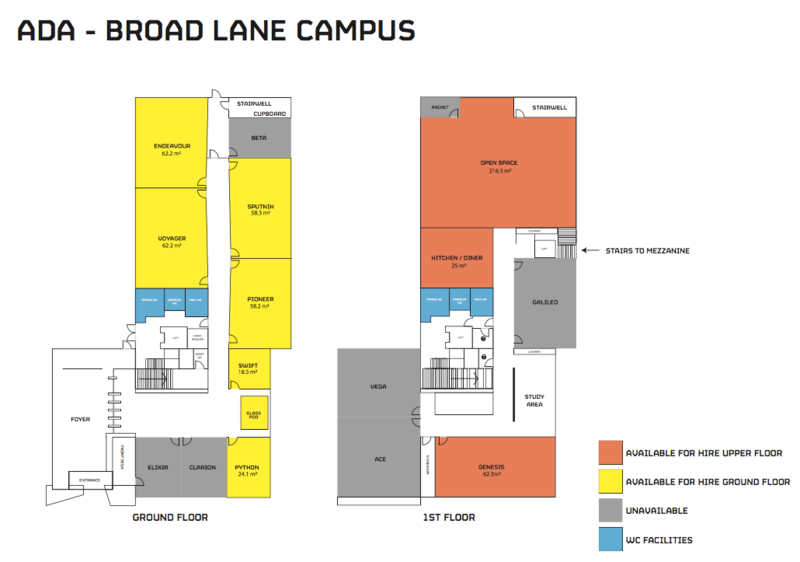 Take a virtual tour of our Broad Lane Campus and browse the rooms available below. Have a look at our rate sheet, and when you're ready, send us an inquiry with your dates and space needs. We offer reduced rates to registered charities, community organisations, Tottenham Hale residents, and local businesses. We welcome all inquiries, but because we are a working college, the highest availability will be evenings after 5pm, weekends, and school holidays. All venue hires come with complimentary tea and coffee service for the number of expected attendees. All classrooms are identically equipped. For coding and design workshops or other group digital activities. To view in higher resolution, please download our PDF floorplan. Our operations team is standing by.